London, in winter. It’s not the most welcoming place and, for three ex-offenders, it’s also not the safest. When each are found with increasingly violent injuries (eventually leading to murder), Marnie and Noah aren’t sure if they have a vigilante on their hands or a series of random crimes. They are leaning towards vigilante but it’s a strong word and not one their new boss (DCS Ferguson) wants to hear, even if it might be the truth. The question is, if it is the truth, why have these victims been picked. What is it about them that made them targets (other than their records) and how are they connected to a missing child and London’s street gangs. Marnie knows that if they can find the link, she can find the killer. What she doesn’t expect to find is a link back to her, and her own past – one where her parents were killed by their foster child – and which she has never really recovered from. It all makes for a tense read and real page-turner of a book. It’s also quite a complex read, with lots of threads weaving together and then unravelling just when you think you have it all figured out. 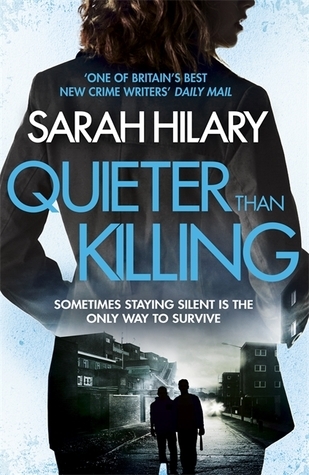 I liked this about it and thought Sarah Hilary did a great job of keeping things interesting without making them confusing. When I was thinking of how to describe this book, I kept coming back to the word relentless – it really didn’t give you a moments pause or let up for a second. I didn’t feel bored for an instant and found myself challenged to guess who dunnit (I did, but only a few pages before Marnie so it was pretty obvious by then). There is an intensity to the writing and to Marnie. She’s another complicated female, my favourite kind, but compared to some I’ve read recently pretty stable and down-to-earth. I got a chuckle when she says “Maverick detectives don’t exist outside of fiction”. She’s probably right and isn’t someone I would describe as a maverick, just a very good policewoman – albeit one who is damaged by her past so slow to let people in and definitely married to her job. It felt refreshing that she didn’t keep running off on her own and ignoring her team or her boss. I also liked Noah, the other main character who has his own story (which nicely intercepts the main plot) which helped make him real, not just a side-kick to Marnie. In fact, there isn’t really anything I didn’t like here (other than realising I haven’t read the third in the series). It is well written, with great pace and interesting characters. I felt involved in the story all the way through and was a bit disappointed when I had to say goodbye to it. For those who haven’t read the other books, it works well as a standalone. So, all in all, a great read that I highly recommend and liked a lot. Note: I received a copy of this book from the publisher in return for a fair and honest review. All thoughts, feelings and opinions are my own. Can’t wait for this one! Just a few more days to go! Glad you enjoyed it. It’s one of my favourite series. I don’t know how they would be on audio as it’s quite dialogue heavy. There is a great bit where they role play the killer for example. If you don’t like the narrator not sure how that would work for you. paper may be the way to go. This sounds really good and like a series that I need to read. I’m finding I get bored with cozies more easily than I used to and have been wanting to read harder edge mysteries. This sounds like a great series to try. I would definitely recommend it. It is gritty (maybe a word I should have used instead of relentless now it’s popped into my brain) but I like it’s smart too. Another one to add to my list! I love when the characters in a thriller have some depth. Thanks for sharing. It really was. I am not sure if it’s available but well worth getting a copy if you can.